Man, I don't even. 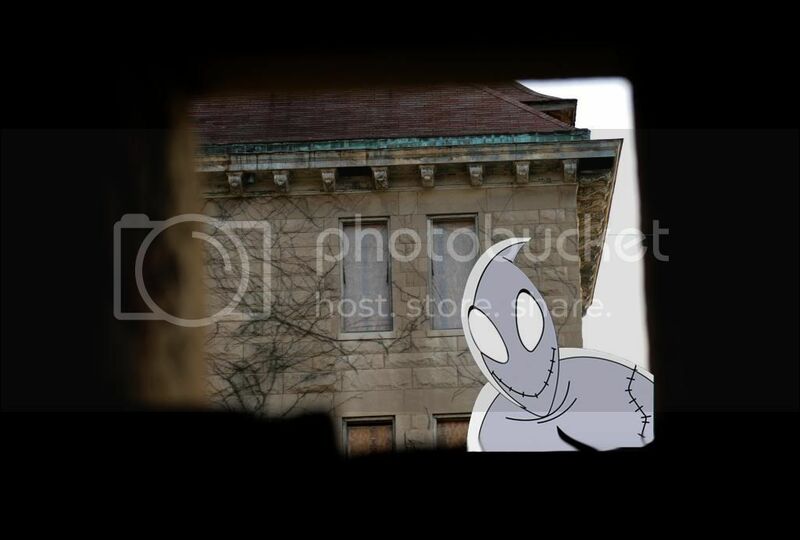 You know I just said last week that I skip the negative reviews, but American Horror Story: Asylum just started and I was so excited about this tour of the old "Illinois Asylum for the Incurable Insane". 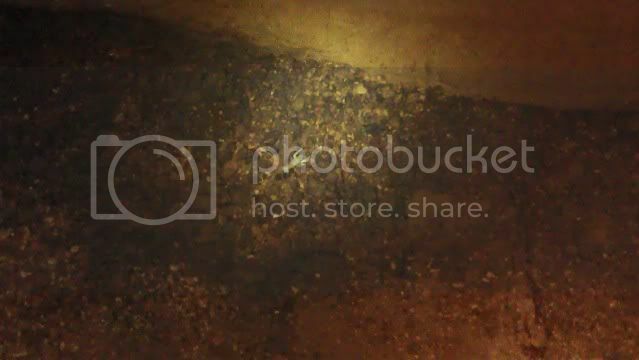 You want to see these pictures, right? I will just let them speak for themselves. This is our review of the "history" tour we drove 6 hours for today. And we're back! Francis and I went to the National Harvest Festival at Silver Dollar City a couple weeks ago and bought a triangle loom from those nice people at Dewberry Ridge, and I took last week off to do more weaving than writing. If we keep up with the weaving we might need to start ANOTHER website! Anyway, the week before Branson, we went back to Stanton. 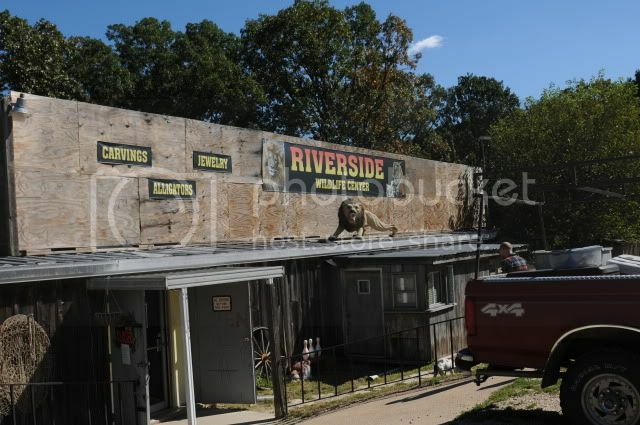 Of course we were there for Meramec Caverns, but we were also there because we FINALLY had time to visit the Riverside Wildlife Center. I've been meaning to stop here for years! Last week at a concert, we were talking to some people we met about this blog, and one asked if we did any Civil War stuff. Well, you know me, I kind of roll my eyes about Civil War reenactments, because the only one I've been too was not much action and a lot of cannon fire. Still, the conversation was fresh in our minds when we were driving home from Branson yesterday and saw the highway sign for Smallin Civil War Cave. 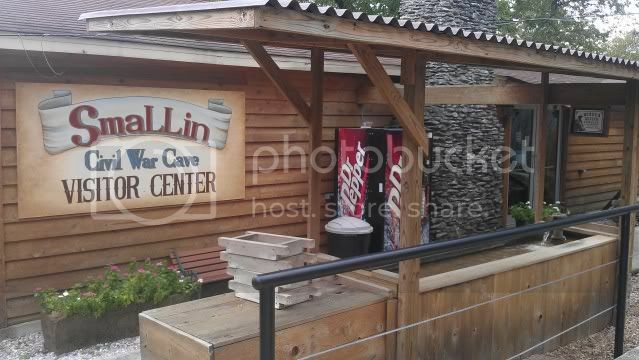 Now, I knew that Smallin Cave was kind of "new", at least in the sense that it opened for public tours a couple years ago and I knew it was family-owned. Most are, I guess, but for some reason I just expected something along the lines of Cave Vineyard or smaller. It's a few miles off the highway on windy county back roads, and I'm going to tell you that when you think, "Lord, what are we doing and how are we going to find the highway again?" KEEP DRIVING. We were surprised to find a sizable gift shop, which you can see above, behind an ancient Native American trail marking tree that signaled a cave (water and shelter) in the area, and the ubiquitous panning for gold. We were even MORE surprised to find out that the tour was an hour long. Still expecting small from Smallin, we set off with our tour guide, Dennis, and another couple. 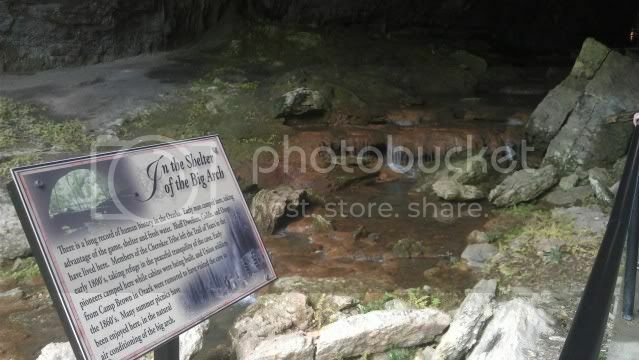 We talked about the history of the area as we walked down the winding path, stopping briefly inside the opening of their smaller cave, Fielden Cave. I apologize for the cell phone pictures, as we had not planned on any blogging this weekend. I'm disappointed in that photo, because it just not enough. That cave opening is 100' wide and 50' tall. I'm at a loss for words even now, because the majesty of nature just blows my mind sometimes. 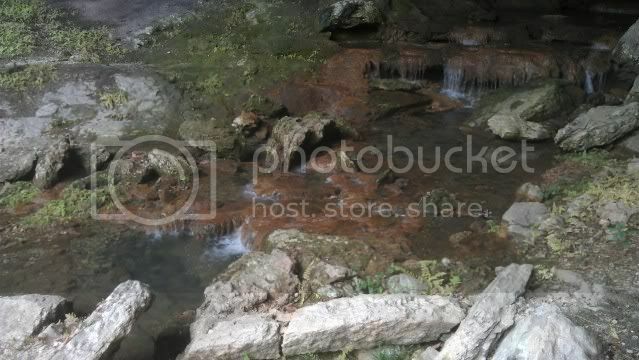 A river runs through the whole cave, over rocks and into pools, and Dennis said he has to use a PA to give tours when the water is higher. 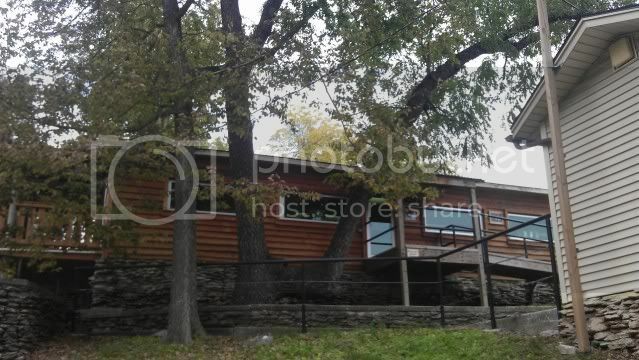 The reason the cave is "new" to the show cave circuit is because the property was owned by a church camp for 35 years. 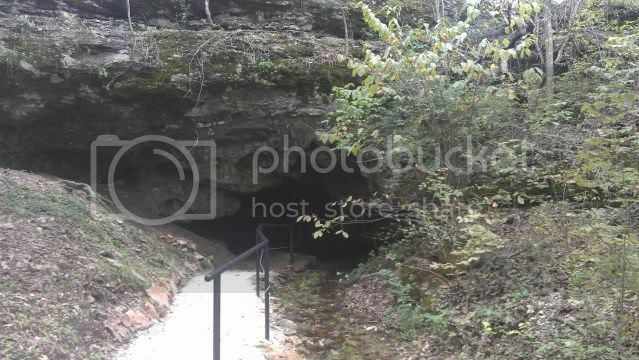 It actually was a show cave back in the 1950s, was on the cover of National Geographic in the 1920s, and was the first documented cave of the Ozarks in the early 1800s. 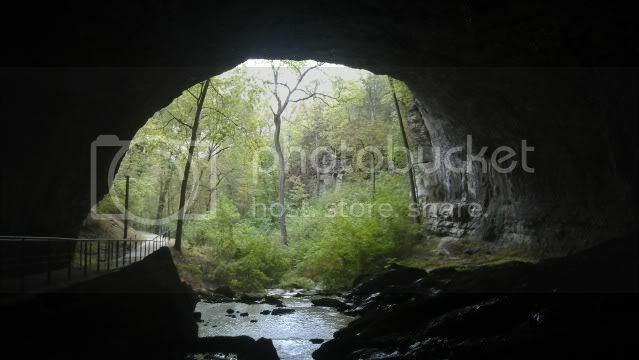 Caves were the first "roadside attractions", especially in the Ozarks. 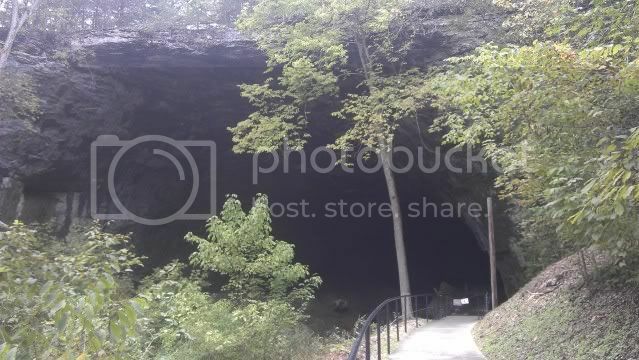 Dennis said that back in the 1960s, Meramec Caverns entrance looked very much like Smallin, before they built the visitors center over the cave mouth. 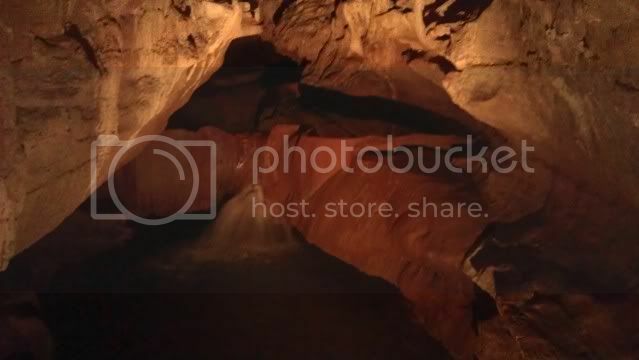 I said that Meramec Caverns is just about the most commercialized cave in the state, and then immediately remembered that Silver Dollar City sprung up AROUND Marvel Cave. What was once the main attraction is now, as Francis says, "Oh by the way, we also have this cave." These days you could walk right by the entrance without even noticing it. 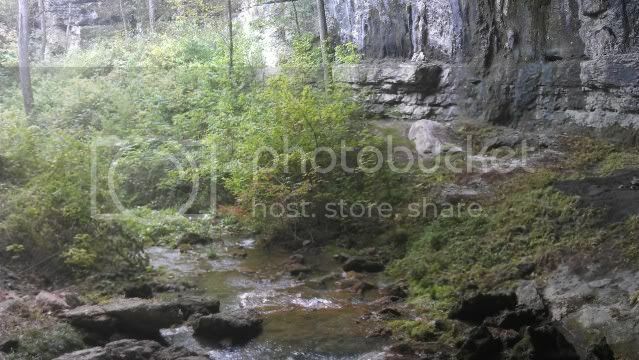 The coolest thing of all about Smallin is that you see so much more NATURE than at other show caves. I like my concrete pathways and electricity when it comes to caving, but it's pretty awesome to see all this water and wildlife undisturbed. This was like cave bingo: they have blind crayfish, blind salamanders, cave spiders, and bats! Two kinds! There's a little blind cave crayfish up there if you look close. Also, fossils all over the place. This cave is a fantastic field trip opportunity for students. It's like a cornucopia of science in here. The Civil War inclusion in the name of the cave comes from the fact that it was used for storing supplies and whatnot during the war, and there's a little bit of a story about a Union spy in the area. It's such a tiny fraction of the history of a cave that has been used by people for as long as people have been in the area. Still, if Civil War history is your thing, every Saturday night in October, they are doing "Civil War Tours", which include chatting around a campfire and a lantern tour of the cave after dark. You can find details on the tours section of their website. They will also be doing Civil War Christmas tours in November and December. This was absolutely, without a doubt, the best impulse stop we have ever made. It literally brought tears to my eyes, it was so beautiful, and such a shining example of everything I love about the Ozarks. If you ever find yourself in the area of Springfield, Smallin Cave is only a couple miles south and is worth a couple hours of your day. Remember, I only had my cell phone, so there is much, MUCH more to the tour than is included here.